Sent in plenty of time for my birthday, this greeting does not contain even the briefest of status updates – there is no clue as to why, or for how long Sue is in Portugal. She hopes to see us ‘all’ at Christmas, suggesting that Sue knew the whole family, rather than just me. Look closely, and above ‘Miss’ she has written, in brackets, ‘I THINK’ Is she wondering if I have got married? 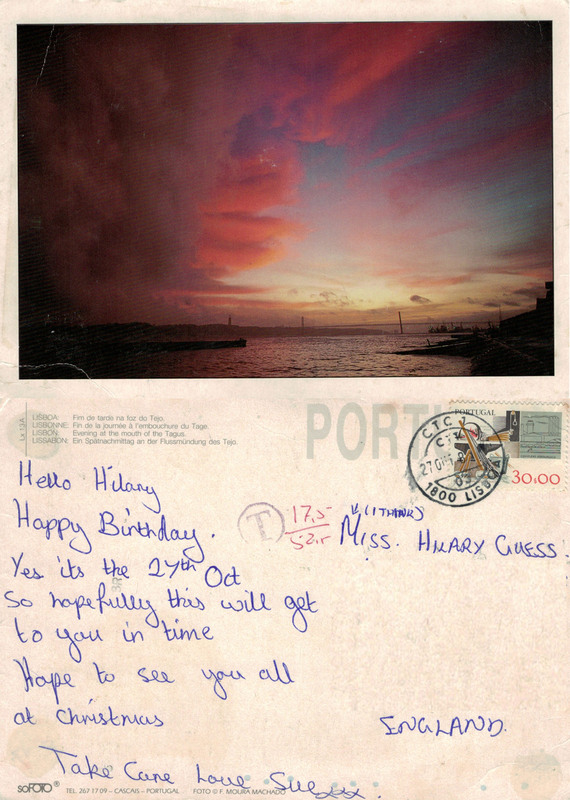 The crucial final number of the post mark date is missing ‘Lisbon 27 Oct 8?’ so I am guessing at ’82, but it could be later. The stamp is from The Development of Working Tools series issued on 2nd January 1980 and in circulation until 31 August 1989. The atmospheric picture on the front is of the mouth of the River Tagus, Lisbon. This is the third Sue that has featured; sadly, also the third that I am unable to identify and with whom I have lost touch 😦 If your name is Sue and you think you recognise your own handwriting, please leave a comment – it would be lovely to reconnect… Here is the first Sue, and the second Sue. This entry was posted in autobiography, Postcards, Social History, Travel, writing and tagged friends, friendship, Lisbon, lost, marriage, Portugal, postcards, River Tagus, status updates, Sue, travel. Bookmark the permalink.